The Fiorentina winger was heavily linked with a move away from the club during the summer. 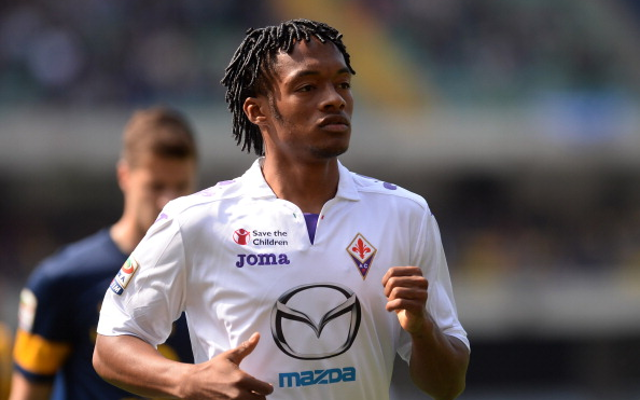 Contract talks between Juan Cuadrado and Fiorentina have reached an impasse over the amount the wingers buyout clause should be set at, the Daily Star reports. Manchester United Cristiano Ronaldo – Check out the latest news regarding the Red Devils next transfer target. The Colombian was heavily linked with moves to Manchester United and Barcelona over the summer but when they both failed to land the wide man, Cuadrado opened contract talks with Fiorentina over extending his current deal. The talks have now broken down because of one issue, the buyout clause. While Fiorentina want the 26 year old’s clause to be at £32 million, the players officials think it should be less. Although the current talks have broken down, Cuadrado is still confident of reaching an agreement with the Italian club. He said: ”The contract renewal? I don’t like talking about this now. There is my agent for this. Although it seems likely that the Colombian international will sign a new deal soon, Manchester United may make another move for him in January with Louis van Gaal still having plenty of money to spend despite the £150 million he lavished on new players during the summer.